A zester is such a versatile and useful kitchen tool. We found 11 ways to use it in our kitchen but zest some citrus and you will also feel you just returned from an aromatherapy session — feels so good! I must confess, I love to zest! Our Microplane Classic Zester has a special spot in our kitchen drawer. We always have it handy, who knows when you may need some zest! So check below for our top 11 list of what you can do with a zester, as well as our lemon zester review which includes the key factors we considered when buying ours. Happy zesting! Add lemon zest to madeleine dough. Flavor pastry creams, tarts and cakes. Make lemon sorbet and other citrus sorbet. Grate Parmesan cheese to top a ceasar salad or a favorite pasta dish. Add color and essential oils to summer salads. Use lemon zest or orange zest in olive oil marinade — great for barbecues or tasty pan-fried dinners! Perfume our evening tea with lemon zest and juice of half a lemon. Add lemon zest to a gin fizz cocktail. Put some lemon zest inside our papillote when cooking a fish en papillote entree. Make chocolate shavings to top our chocolate mousse. There are a few options: you have long zesters (about 8 inch long) that double up as a cheese grater and you have short zesters that make long thin strips of zest. We find most value out of a long zester and in addition, there is no need to chop the thin strips of zest so it’s quicker. For more tips on how to choose a zester and our deal-breaker features, check Art of the Home best lemon zester review below. Why do I need lemon zester? Lemon zest adds a beautiful color to any dish but most importantly, the zest and essential oils extracted by using a zester adds that delicious flavor to dishes and cake as well as provide the benefits of lemon oil. So why not put some zest in your life and on your table with a lemon zester! How do I use a lemon zester? Very simple! First you need to clean and dry your citrus (lemon, orange) — this is especially important if you are not using organic lemons (our favorite are Meyer lemons– dreaming of a Meyer lemon tree!). 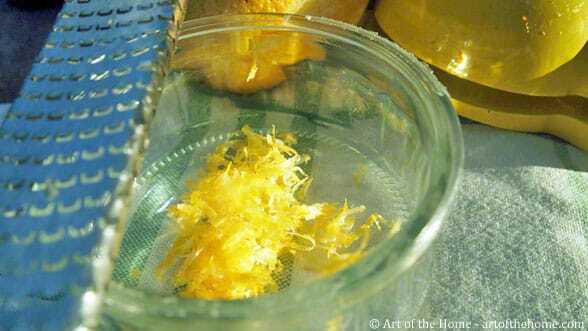 Then place the lemon skin on top of the grating edges and glide your lemon on the zester, then rotate it slightly (to move away from the white part where you just zested) and repeat. Only put the yellow skin of the lemon on the zester however. If you zest on the white part (which has no zest), it will give your dish a bitter taste. Finally, tap-tap on one side of the zester and the zest will fall inside your mixing bowl or on your cutting board. With your finger, you can also gather the zest left inside the zester (on the other side of the blades). So easy and it smells so good – zesting is a joyous moment! What should I be looking for in a lemon zester>? Easy Grip: look for a good grip. Some are sold without a handle and that’s a deal breaker for us — we need to be able to get a good grip, especially with such a sharp object. Sharpness: it has to be very sharp so you don’t have to press too much on the citrus to get the zest and extract the essential oils when zesting. Convenience: dishwasher safe is always a plus. Durability: The blade is made of 18/8 stainless steel and is constructed in the USA — always a plus. Easy Grip: this lemon zester has an ergonomic handle so you can comfortably zest or grate. Microplane does have another high quality zester without a handle but we would not dare to use it. Sharpness: watch out, those grating edges are razor sharp but that is the point and because of the handle you can manipulate it safely. Convenience: dishwasher safe but we hardly put ours in the dishwasher. It rinses really well with a sink sprayer or you can also quickly rinse it under a stream of water from the faucet. Price: very reasonable at Amazon. So to add some zest to your kitchen, Art of the Home recommends the 5 star rated, multi-purpose, and low-price Microplane Classic Zester/Grater.